Models 164 and 251 have a two-battery electrical system, consisting of a battery (G1) and an additional battery (G1/7), both under the front passenger seat. The battery (G1) supplies all the electrical consumers in the vehicle and is also used for starting the engine. The capacity of this battery is 1.2 Ah. The additional battery (G1/7) is charged by the front SAM control unit (N10). 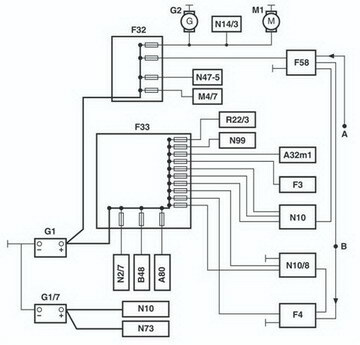 The front SAM control unit (N10) also incorporates a battery state recognition function (BZE) for the additional battery (G1/7). 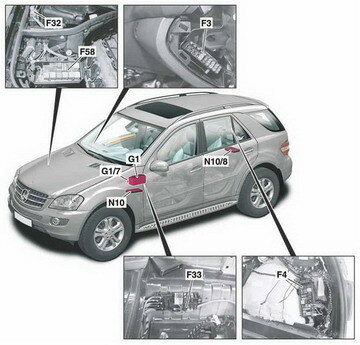 The battery (G1) is located under the front passenger seat and can be removed without having to remove the seat. The additional battery (G1/7) is located beside the battery (G1) under the front passenger seat and can be removed without having to remove the seat.